Natural Planet™ contains important supplements: proteinated minerals and vitamins essential for a long and healthy life. Natural Planet™ Chicken Formula Dog Food contains high levels of Omega 3 and Omega 6 fatty acids and taurine. Organic chicken, chicken meal, organic oats, organic barley, organic peas, natural turkey and chicken flavor, organic brown rice, chicken fat (preserved with mixed tocopherols and citric acid), organic sunflower oil, calcium carbonate, organic flaxseed, dried brewers yeast, potassium chloride, salt, dried tomato pomace, salmon oil (preserved with mixed tocopherols), minerals (zinc proteinate, iron proteinate, copper proteinate, cobalt proteinate, manganese proteinate, selenium yeast), blueberries, choline chloride, organic alfalfa meal, organic sunflower seeds, organic pumpkin seeds, organic carrots, broccoli, vitamins (vitamin A acetate, vitamin D3 supplement, vitamin E supplement, niacin, d-calcium pantothenate, thiamine mononitrate, pyridoxine hydrochloride, riboflavin supplement, folic acid, biotin, vitamin B12 supplement), lactic acid, dried chicory root, lecithin, sage, L-ascorbyl-2-polyphosphate (source of vitamin C), yucca schidigera extract, garlic, calcium iodate, rosemary extract, yeast culture (Saccharomyces cerevisiae), dried Enterococcus faecium fermentation product, dried Lactobacillus acidophilus fermentation product, dried Aspergillus oryzae fermentation extract, dried Trichoderma longibrachiatum fermentation extract, dried Bacillus subtilis fermentation extract. 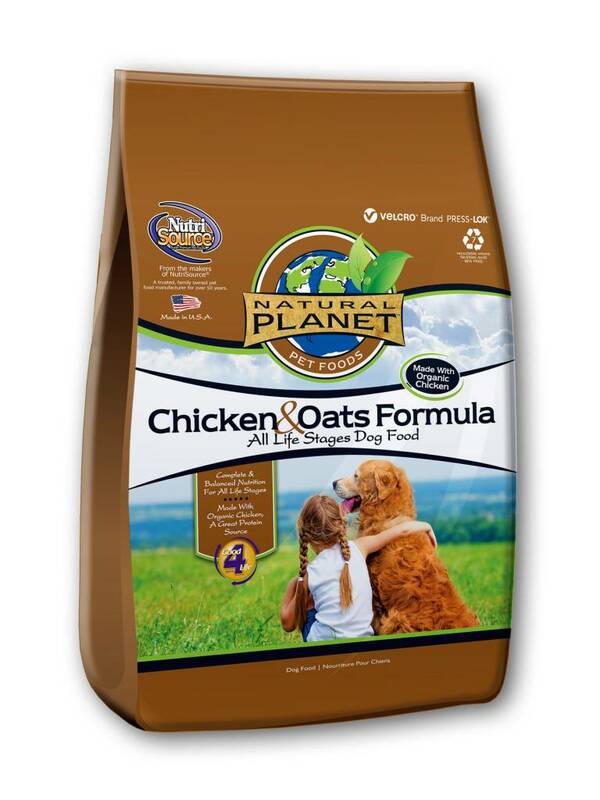 Natural Planet™ Chicken & Oats Formula Dog Food is formulated to meet the nutritional levels established by the Association of American Feed Control Officials (AAFCO) Dog Food Nutrient Profiles for all life stages except for growth of large size dogs (70 lbs. or more as an adult).